American Stage cables are built to ensure that your tone comes through exactly the way you want it. The 10-foot length is ideal for shorter runs, such as guitar-to-pedal board, and smaller stages.Planet Waves American Stage Series cables are designed with audiophile quality wire, made in the USA, designed to reproduce the natural tones of your instrument with zero interference. The low 28pF/ft capacitance is the sweet-spot for uncolored tone and the 22AWG oxygen-free copper conductor provides exceptional signal transfer. American Stage cables reject interference and avoid handling noise with 100% shielded coverage and 95% tinned copper braiding.Traditionally, mechanical tolerances of 1/4-inch jacks can vary greatly causing unreliable connections. Always seeking to innovate, Planet Waves designed the patented GEO-TIP plug and partnered with Neutrik for production in their state-of-the-art facility in Lichtenstein. The unique shape of the GEO-TIP design ensures a secure connection in any instrument, pedal, or amp jack. 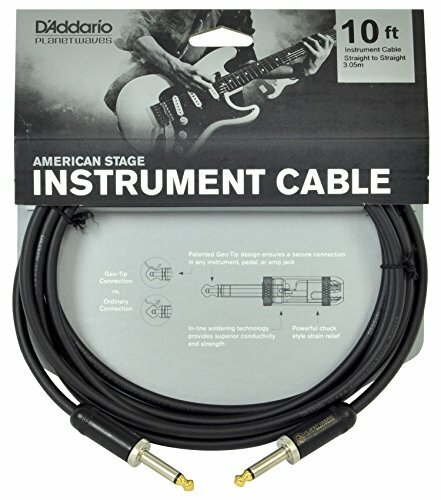 Using only the finest materials, custom designs and precision USA manufacturing methods, American Stage delivers a professional performance cable. The result is pure, natural tone guaranteed for life. Planet Waves cables are the ultimate musician's cable. Utilizing exclusive In=Out Technology for pure signal reproduction, Planet Waves cables are built tough to withstand gigs and come with a limited lifetime guarantee. Planet Waves is a part of the D'Addario and Co. family of brands, the global leader in musical accessories.